Oma and Opa are busy with a remodel project and were in need of new wall art. 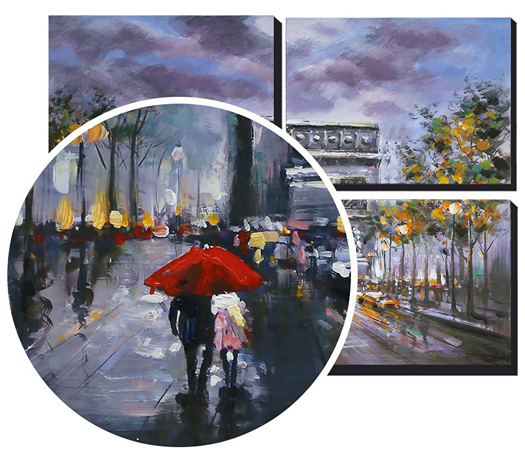 This four-piece Handmade Oil Painting is a very pretty depiction of a Paris theme. I fell in love with the bluesy / purple color mix. The Arc de Triomphe was commissioned by Napoleon. It is one of the most famous monuments in Paris and stands in the center of the Place Charles de Gaulle – I can’t wait to see it in person. The four separate paintings arrived in one box, but individually wrapped, in perfect condition and ready to hang. Each panel is stretched and framed onto solid wood stretcher bars with a hook already fastened on each one. You simply take them out of the box and hang. This would make an awesome house warming gift. A stunning and original set of art at an affordable price is no longer too good to be true. Asmork Modern Art makes gorgeous artwork accessible to anyone. 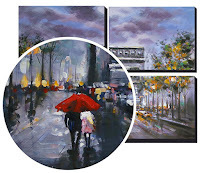 This stunning brightly colored these modern style paintings in an attractive 4-piece display. One-of-a-kind textured oil painting bursting with color. Uniquely textured for an impressive display that's perfect for your dining room, living space, bedroom or office. Since each piece is original, your version may differ slightly from the photo, but you're still guaranteed to love it. Three-Piece Wall Hanging that's ready to go as soon as you take it out of the box. All ready to go and easy to hang anywhere you desire some extra flare. Each canvas panel is stretched onto a sturdy solid wood frame and designed to last. Makes a fabulous and unique gift for friends and family who appreciate the finer things. Art is the gift that keeps on giving. Next birthday or wedding give a gift that your friends and relatives will remember. Protected for turbulent shipping practices and guaranteed to make you love your home a little bit more. Personally inspected before shipping to ensure a beautiful painting every time and packaged with great care and precision, so your art arrives in tip top condition. If it doesn't suit your living space we'll give you a full refund no questions asked. 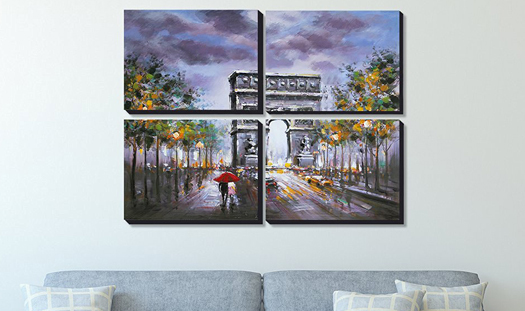 Get your gorgeous 4-piece Landscape Oil Painting today! RICH TEXTURE PAINTING - Rich texture hand painted by professional artists on HD Spraying. You can see the texture of the paint and the brush strokes that were used when they were being painted. Your actual painting may be slightly different from the product image due to different brand of monitors. DIMENSION - 12 x 15.7 inch x 4pcs (30 x 40cm x 4pcs). Stretcher depth: 1.2 inch. They work perfectly in the living room, dining room, bedroom, kitchen, bathroom, office, hotel, bar, or patio. HANG EASY AND IMMEDIATELY - You can hang your decorative canvas oil painting set as soon as you receive them! Each panel is stretched and framed onto solid wood stretcher bars with a hook on each one. QUALITY & PROTECTION - Packed with the utmost care and protection so that your beautiful new piece of art will arrive blemish free; carefully inspected prior to shipping for quality and to ensure it's in perfect condition when it reaches your doorstep. Asmork is one of the art brand from SHENZHEN ART 'S CO.,LTD, there are more than 200 professional artists and more than 10 creative designers worked for this team,all our artists are professionally trained with excellent technical skills,they work with colorful passion and imagination.